I've been struggling a bit to capture a concept that I believe represents a fairly fundamental shift in how we need to think about Training Design. Back in 2005, 2006 and 2007, I would regularly show the following slides to help explain the heart of what Training Design is all about and how it has changed over the years. 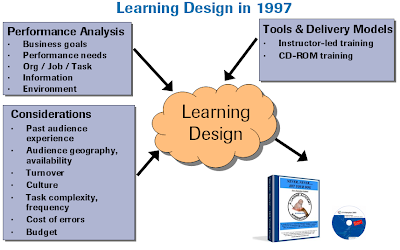 Oh, and I called it Learning Design in the diagrams, but I'm afraid that it's really more about Training Design. Basically, we conduct an analysis (sometimes extensive, often very quick) to determine what we are really trying to accomplish. We take into account a wide variety of considerations. And we consult our delivery model options to do this fuzzy thing - Training Design. 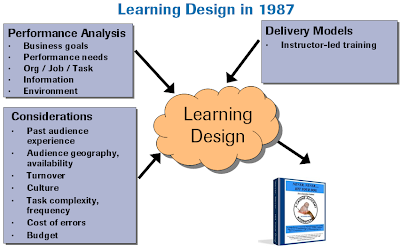 Back in 1987, the dominant tool was classroom delivery and thus, we primarily created training and train-the-trainer materials. We kept these in notebooks which adorn many shelves today (but are getting rather dusty). Ten years later, life was good because we had another Training Method available, the CD-ROM allowing us to train individuals. Yes, we theoretically had this back in 1987 with paper-based materials, but we looked at the CD as a substitute for classroom instruction. In 2007, we suddenly had a whole bunch of different delivery models. Virtual classroom, web-based training (WBT), rapidly created eLearning, lots of online reference tools such as help, cheat sheets, online manuals. We also had discussion forums, on-going office hours. In many cases, this makes our final delivery pattern much more complex, but it greatly reduces the time required upfront by learners and allows us to get them information much more just-in-time and with more appropriate costs. However, when you look at these models, the design is roughly the same. Maybe this more appropriately would be called Learning Design - or eLearning Design - or maybe something else that implies performance support as well. Now the interesting part ... the heart of the picture and realistically how we approach training design in 1987 is the same as it was in 2007. My sense is that we may need a new picture because of eLearning 2.0. Yes, you can think of Blogs, Wikis, etc. as a means of enriching the Training Design much the same as a discussion group alongside formal instruction. Pretty much when Harold, Michele and I worked together to design the Web 2.0 for Learning Professionals Course, we settled on using Ning and it's various capabilities as part of the delivery pattern. This is the same picture as above. However, what about the case when you are providing tools and really don't have the content defined ahead of time? How about when you build skills around scanning via RSS, social bookmarking, reaching into networks for expertise, etc.? What about when you help individuals about blogging as a learning practice? When you support informal / self-directed / workgroup learning? Is it the same picture? Maybe it is? Maybe we conduct a similar performance analysis and take into account similar considerations and then provide appropriate structure (delivery pattern). Maybe we are providing a Wiki and conducting a barn raising session? My sense is that there's something different about it? But I'm so used to having this as my mental model, that I'm having a hard time figuring out what the alternative is? The item missing in each slide is "Design". As you suggest, elearning 2.0 tools can be used to support traditional approaches to e-learning...to bring collaboration to a traditionally designed program. But i think what you're getting at is what constructivist approaches to learning design have been getting at in recent years. Learning is social and informal and humans construct their knowledge through interaction of the type that web 2.0 tools excel at. So you might look to constructivist design models as an alternative to the traditional instructional design approach that your slides represent. Taken to it's extreme constructivist learning is the antithesis to traditional "instructional design". The only "design" is to surround people with tools and opportunities to learn and construct their own knowledge base. This is quite different from the defined performance and task analysis, learning objectives etc of traditional (e)learning design. Personally, I think we need both. Social/informal learning is wonderful for professional knowledge workers that continually need to develop a knowledge base to be effective. But the work world is full of procedural, process oriented work that are best learned using good old fashioned instructional design methods. Tom - thanks so much for the insightful comment. I'm not sure I quite get "The item missing is Design" ... but the rest makes sense. The question I have is that ultimately we are trying to help foster an environment where people learn. As you say, the design is "to surround people with tools and opportunities" - I would add skills to that list, but that said - there's still a design element to it right? As Jay Cross talks about - creating the learnscape or whatever term he's using now. So, is that different than what is pictured? Do we look at things that are quite different? Or is it that we can't think about the patterns that result as the same thing? My gut reaction is that it has to be the latter. I'm hoping to get more input on this. My thoughts on this very much mirror Tom's. It's not that we need to change the model, it's that we need to have two models. eLearning 2.0 addresses a different need than traditional instructional methods. Whereas formal learning is great for relatively large, static topics (corporate new-hire training is one example), eLearning 2.0 is much more appropriate for small, dynamic topics and knowledge sharing. This is a need that has always been there, but that we couldn't effectively address until the advent of Web 2.0 technologies. So we keep using the old model when the need is for formal training, and we use a new model for developing eLearning 2.0 content. The question is: what does this second model look like? To my mind, the model is similar to what Tom described. You enable your population of users to create content, and give them the tools to do so. To assist them, it might be appropriate to have an individual - let's call them a Social Learning Specialist (SLS) - who is available to help them find resources, publish their content, and so forth. Maybe the SLS is also available to help others locate useful content. They probably also create a lot of content themselves, and help maintain the site. The full details of the SLS role aren't important. 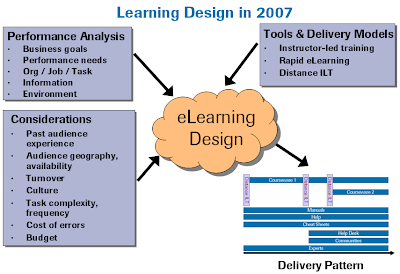 I guess my point is there doesn't need to be a "design" phase in the eLearning 2.0 model. Users will create content to fill the gaps they perceive. If the content they create is bad, whether because of its design or because of its content, then people won't use it and eventually it will be replaced or fixed. oops, meant to delete the "missing in each slide is design" when i looked at your slide again and noticed it is there. But i do think that what happens inside your "design" bubble is where the difference is between a design approach for informal, social learning vs. more task based formal learning. There are many constructivist learning models out there and they are tangibly (and philosophically) different than the more behaviourally oriented models of traditional instructional design. They are certainly much less prescriptive but do include lots of "principles" and "learning contexts" that make a lot of sense for the use of social media tools and elearning 2.0. I don't see constructivism (or elearning 2.0) as a panacea but they can be really useful for the knowldge generation aspects of knowledge work. i did a quick search and found this but there is lots more like it out there. Byron - that's exactly the question I was asking. And that's a great perspective. So design is creating the tools and maybe doing some upfront planning, BUT, there's a new on-going role that is different where things change and evolve. I also think there's something that's a bit wrong with the picture where the implication is that the content exists in some stable form as opposed to growing. Would we expect the tools to change? Maybe, but it's more likely that we are laying down empty boxes or partially filled boxes and then fostering growth. I need to think about that picture. 1. Pose "good" problems - realistically complex and personally meaningful. 2. Create group learning activities. 3. Model and guide the knowledge construction process. That sounds a lot like learning design as depicted. I know that you likely meant something more along the lines of what Byron was saying, but this is the whole problem I'm grappling with. If it's not Learning Design as depicted, what is it? What are you doing? I'm going to have to noodle a bit on the thought that the picture has empty content items at the start. Great stuff guys - very much appreciate your insights. We are on the same quest for a new way to think about design. learning environment design and wrote an article for E-Learning Guild in October. Without getting too long here... I think we have to put a new step in between performance analysis (defining performance needs and supports/barriers) and designing a specific learning solution for a knowledge or skill gap/development need. In the new step, we should strategize (design) a versitile, robust learning environment that enables informal and ongoing learning. The learning environment should support the just-in-time, just-enough needs AND emerging needs. A learning environment includes formal training and education offerings, but also includes relationships and networks, resources and tools, and management and company support for learning. We may conclude that a course of some kind or a specific web 2.0 solution might be part of the learning environment mix - and then we can work to design that part (which I think is still done with an ADDIE frame of mind, but flexibly implemented according to the needs of the solution we are designing). I'm not sure this captures the full gist... if you'd like to talk about it directly, I'd really enjoy that - because, as I said, we are on the same quest. Hello - your post captured my imagination -- as I have been struggling with something similar. You ask "what's missing" but perhaps that's the wrong question. Is it that the process *has* changed and your mental model has just not adjusted? So maybe the question is what are you actually doing now? Recently, I've started thinking about design as a tag cloud. For example, we might start with a definition of the topic, learner, industry. These 3 things may have metadata associated with them which leads us to other data/definitions/ ideas. It's a series of linkages. We may come back to the original terms we started with and refine. If we pay attention to how we move through the tag cloud, we become aware of our personal design schema or design environment or whatever framework fits. Maybe this is the way we've always designed but needed to put a more rationale linear picture to it. I hope this makes some kind of sense -- still working it out and it's still fuzzy. Thanks for the post. @Ran - that's an interesting thought process. As you work through it, I'd be curious what you come up with. Thinking a little further about this I came up with this visual schema about how I move through the process. Not sure if this is quite "it" but it feels ok for now. Playing with the idea that the design process should reflect the learners process.